I’ve been made a lifetime member of the Environmental Investigation Agency or EIA for short. I think this campaigning organisation fighting eco-crime should be getting more attention. Founded in 1984, the EIA is rather unique in its approach to campaigns. Whether it’s illegal logging, smuggling ozone-destroying chemicals or trading in endangered species, they have under-cover detectives finding out what’s going on. At their open day, which I went to this week, we were able to see some of the equipment they use to secretly film these activities. I wanted to take some photographs of the more ingenious methods used but they didn’t want them to be publicised, so I can’t reveal any more. Currently, one of their biggest concerns is the illegal trade in tiger parts. 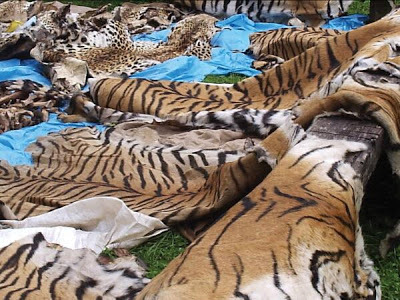 Wild tigers in China are slaughtered for their skins which are then used in luxury rugs. And tiger farms have been found to be selling wine made from tiger bones. Another threat to tigers is destruction of their habitat – a few years ago EIA campaigned against illegal talc and marble mines that were operating in what should have been protected tiger areas. Ivory trading is also targeted by the EIA – in 1989 they played a key role on getting it banned. But they report that in 2009 ivory seizures have soared as elephant poaching is on the rise. The organisation is going to be working on the ground to gather evidence of the syndicates responsible, so they can be brought to justice. Only this week it’s being reported that Bristol City Council are planning a plant-fuelled power station. Apparently, one of the main feedstocks will be palm oil. This vegetable oil is also ubiquitous in a vast range of everyday products from soaps to soups and from chips to chocolate. EIA logging investigators says that the spread of palm oil plantations is a major cause of deforestation, which in turn is a significant contributor to climate change. In Europe, as much as 19% of wood imports come from illegal or suspicious sources. In the US it’s nearly half that because in 2008 it became illegal to import or sell products made from stolen timber. And EIA helped get this on the statute books. They hope to do the same in the UK. My involvement with EIA is through the Chilling Facts campaign, now in its second year. Targeting UK supermarkets we wanted to highlight the huge climate change impact of their refrigeration gases, which are responsible for nearly one third of their carbon footprint. EIA is calling for a worldwide ban on HFCs. This is technically possible, but politically difficult. However, I’ve managed to give both Ed Milliband and his shadow Minister for Energy and Climate Change, Greg Barker, the technical briefing document about the campaign. The first Chilling Facts survey was published in January 2009. Ranking the supermarkets on their commitment to moving away from HFCs, it highlighted how little attention had been paid to the issue. However, the second survey showed significant progress, as all the major players had some improvements to report. And some were setting a deadline for phasing out HFCs – although there’s still a long way to go. Next year we’re planning to include air conditioning in our survey, as this uses HFC gases too. And we’re going to be looking a the disposal of refrigeration equipment – we think that supermarkets may not be keeping track of this. In particularly, we’re worried that the climate-unfriendly cooling gases are not being captured, as they should be. If you want to know what’s happening on the front line of eco-crime, join EIA and find out. And click here to see a video overview of their work. This entry was posted in BLOG, Campaigning, Charities & NGOs, Conservation & Wildlife, Done, Energy & Climate, News 2010 and tagged Climate change, Refrigeration, Wildlife. Wow! This is a fantastic idea!